Improv actors and writers are typically at opposite ends of the personality spectrum, though not always. Acting is a very extroverted activity since the actor has to perform in front of an audience, using big motions, a big voice, and a lot of heart. Performing improv makes acting even more challenging because it’s spontaneous, involves thinking on your feet, and forces the actor to think on their feet. In contrast, writing is a solitary act, and though big heart comes into play, it is not typically done in front of large audiences or spontaneously. Writing is more introverted because it involves more critical thinking and introspection. It is also more time-intensive, requiring the writer to work for longer amounts of time compared to the improv actor, who must react quickly. Although actors and writers might not have a lot in common, acting provides a great model for the way writers should write. 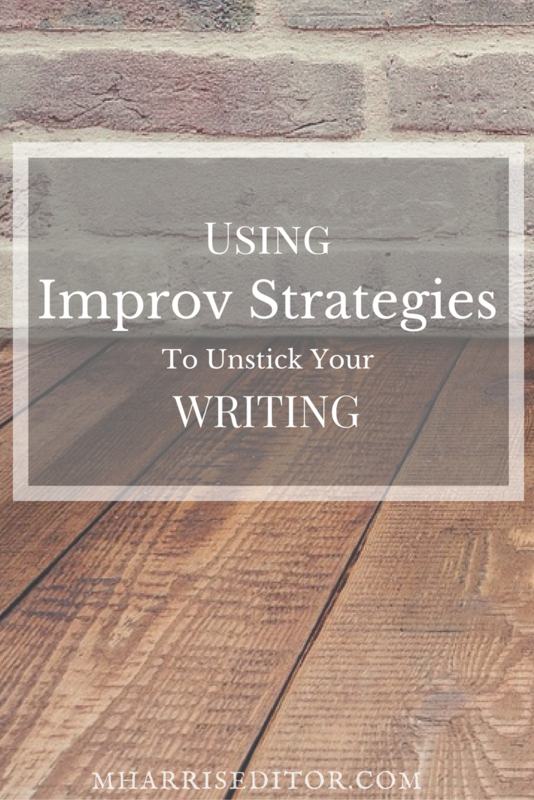 If you feel like you’re procrastinating on your writing or you can’t get away from writer’s block, take some cues from improv! One of the most common ways improv acting forces actors to think on the fly is through the prompt, “Yes, and…” When an actor uses this in their sketch, they are forced to continue the story in such a way that their character is in control of the fate of what is going to happen. When you’re writing and you get stuck, using “Yes, and…” in the next scene helps you keep the forward momentum. For example, if you have a character who is about to do something dangerous, but another character intervenes, using “Yes, and…” as a prompt helps you determine what comes next. Even if you decide to change it later, using this prompt while you write helps you to keep the creative process moving rather than overthinking what you’re doing. Improv forces you to think quickly. Delay your reaction too long and the scene falls flat. The same can be said about writing. If you get in your own way and keep the scene from continuing, you’re more likely to stop writing. This is especially true if you stop writing to edit in the middle of the process. You wouldn’t stop an improve scene to go back and fix what’s already been done – why would you do the same thing to your writing? Successful improv actors aren’t afraid to flip a scene on its head. What was once a lighthearted, humorous can quickly turn into a sketch with gallows humor that no one saw coming, further enhancing it overall. You can apply this same principal to your writing. If the tense isn’t working, change it to another one, such as from past tense to present tense. If your scene falls flat, change the point of view so you can better write the story. If one character isn’t speaking to you anymore, evaluate their usage in the story and consider cutting them altogether. There are many possibilities to unstick your writing if you step away from what you’re doing and find a way to incorporate creativity when the going gets tough. No matter if you’ve hit a roadblock in your writing or are trying to find other ways to write creatively, borrowing from another art form can help you accomplish your goals and try new approaches to your work.